The Serra da Arrábida Natural Park (Parque Natural da Arrábida) covers an area of over 100 square kilometres and is only about a 30 minute drive south from the capital city of Lisbon. It was given protected status as a national park in 1976 to preserve its natural beauty. Whilst the park and its beaches are popular with day trippers from the city, few tourists are aware of its existence. The landscape was once used as a backdrop to the James Bond film On Her Majesty’s Secret Service during the scene when Bond’s newlywed wife is killed in a drive-by shooting. The route Estrada de Escarpa is known to be one of the most scenic in the country. The park offers beautiful natural scenery and is known for its steep hills and green shrubs. Visitors can enjoy wonderful views of the sea from the many hiking trails which criss-cross the park. The sheltered bay below is famous for being home to a large pod of dolphins which lucky visitors might catch a glimpse of leaping in and out the surf. The trails are rarely busy and offer an excellent tranquil and natural getaway from the noise of the nearby city of Lisbon. Look out for wild boars which are common in the shrubs and sometimes even come down to the coastline. Along the coastline, the rolling hills have been eroded to form steep cliffs looking down on the calm, turquoise waters of the bay. The sandy beaches within the park are known to be some of the best in Portugal. Unlike the beaches in Lisbon, the waters here are protected from the Atlantic currents by a large headland and can be excellent places to swim in the summer months. Whilst this is not well known among tourists, locals do know about the wonderful beaches and they can become busy during the summer months. In particular, parking can be a problem, but bus services run between the nearby cities of Lisbon and Setubal and the beaches. The biggest, most easily accessible and most popular beach is Figueirinha. It has modern parking facilities, and a bar and restaurant. In the summer months, there is often a DJ and some lively beach parties are thrown here. 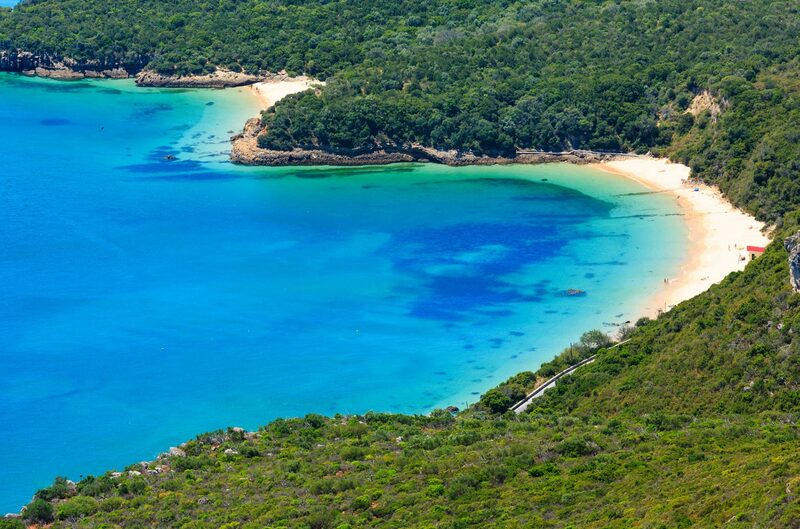 Portinho da Arrabida is reputed to be the most beautiful beach in the park and is popular for snorkeling as well as scuba diving around the small island of Anixa, which is located close to the beach. There is also a bar, and a popular maritime museum found to the south of the beach which houses a natural history collection from the areas historic fishing days. The cove of Praia dos Galapinhos is a little harder to reach, found down a steep, cliff-side staircase, but because it’s that bit harder to access it can be far less busy than some of the other beaches. 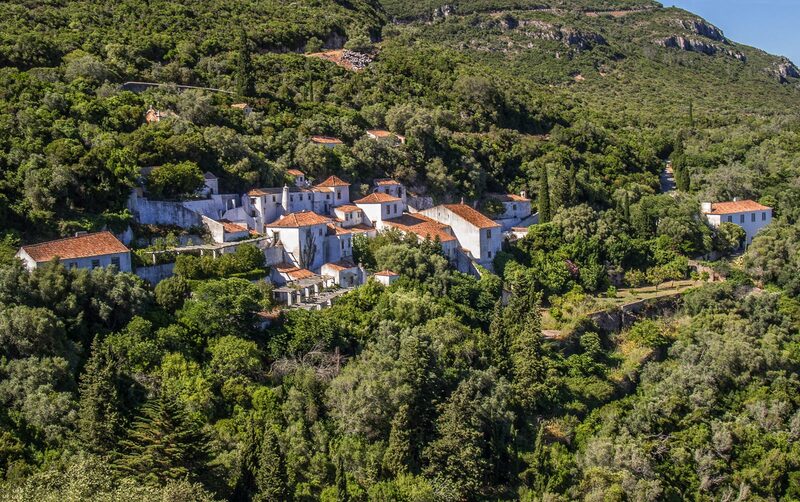 Overlooking the beaches is a 16th Century monastery, the Convento da Arrabida, built using white bricks that stand out among the green vegetation on a site where there was once said to have been a vision of the Virgin Mary riding a mule up the hillside. There are a number of small chapels in the hills surrounding the monastery. Dotted around the cliffs here are tracks made by dinosaurs from the cretaceous period at Cabo Espichel and Jazida dos Lagosteiros, both of which are signposted.